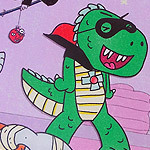 Site Updates - Dinosaur Dracula! Dino Drac’s Funpack Subscriptions – Now Open! 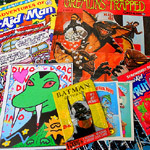 Dino Drac Funpack subscriptions are back on sale! 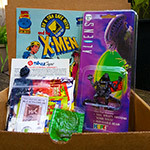 $25 a month, for a new box of weird junk, every month! 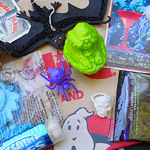 Subscribe now and you’ll start with the SEPTEMBER 2014 FUNPACK — which, since the site will be firmly entrenched in the Halloween Countdown by then, has a nice dose of scares! 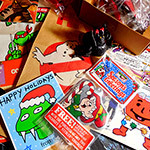 Dino Drac’s “Big Boxes of Joy” for sale! Dino Drac Funpacks For Sale! Christmas Stickers / Ugly Sweater. Dino Drac Halloween Prints for sale! The 1st ever piece of Dino Drac merch is available nowwww. Go buy yourself a limited edition (ah ha ha) “Halloween Countdown 2012” print! It’s in color! Make me some spooky art. This weekend, I’m leaving the site’s content in your hands. New Features on Dino Drac! New Feature: Casino Games, for the SMS.